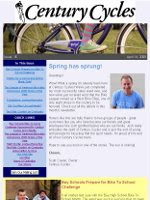 The latest edition of the Century Cycles eNewsletter is making its way across the Internet at this moment, so if you're a subscriber, look for it in your Inbox any minute now! If you aren't receiving our monthly eNewsletter, you can read it online here. From there, you'll also find links where you can sign up to receive your own copy, or forward it to your friends! A great kick-off to another Night Riding Season! First Night Ride is this Saturday! Fewer Roads = Less Congestion? Check us out at The Winking Lizard Tavern! Century Cycles has bikes as sweet as cupcakes! Define everything. Ride a bike. It's a Pink Sweetheart miracle! Spring Break Sale Starts Today!